The American Headache Society, the American Headache Disorders Advocacy, the World Health Organization and the Migraine Research Foundation list the following facts about migraine and headache disease. Sharing these facts via social media is one way of becoming an advocate for your disease. The number of women in the US with chronic migraine is about the same size as the population of the state of Iowa at 3.2 million. The number of men in the US with chronic migraine is about the same size as the population of San Francisco at 750,000. The combined number of people in the US with chronic migraine is about the same as the population of Los Angeles and Chicago combined at about 4 million. It is estimated that 144 million people in the world have chronic migraine. This is the same as the number of people who watched the Super Bowl and Oscars combined. There are 36 million migraine patients and funding for research from NIH equates to $0.67 per patient. In contrast, there are 350,000 patients with multiple sclerosis and they receive funding equivalent to $291 per patient from the NIH. Not only is headache painful, but it is also disabling. In the Global Burden of Disease Study, updated in 2013, migraine on its own was found to be the sixth highest cause worldwide of years lost due to disability (YLD). Headache disorders collectively were third highest. Only half of those identified with migraine had seen a doctor for headache-related reasons in the previous 12 months, and only two-thirds had been correctly diagnosed. Most were solely reliant on over-the-counter medications. Appropriate treatment of headache disorders requires training of health professionals, accurate diagnosis and recognition of the conditions, appropriate treatment with cost-effective medications, simple lifestyle modifications, and patient education. In the United States of America and the United Kingdom, only half of those identified with migraine had seen a doctor for headache-related reasons in the previous 12 months, and only two-thirds had been correctly diagnosed. Most were solely reliant on over-the-counter medications. Barriers to effective care: Lack of knowledge among health-care providers is the principal clinical barrier, Poor awareness extends to the general public. Many governments, seeking to constrain health-care costs, do not acknowledge the substantial burden of headache on society. While most sufferers experience attacks once or twice a month, more than 4 million Americans have chronic daily migraine, with at least 15 migraine days per month. Migraine is an extremely incapacitating collection of neurological symptoms. Before puberty, boys are affected more than girls, but during adolescence, the risk of migraine and its severity rises in girls. Roughly 1 in 4 women will experience migraine in their lives. Three times as many women as men suffer from migraine in adulthood. About half of female sufferers have more than one attack each month, and a quarter experience 4 or more severe attacks per month. Migraine often goes undiagnosed in children. Half of all migraine sufferers have their first attack before the age of 12. Migraine has even been reported in children as young as 18 months. Recently, infant colic was found to be associated with childhood migraine and may even be an early form of migraine. Children who suffer are absent from school twice as often as children without migraine. In childhood, boys suffer from migraine more often than girls; as adolescence approaches, the incidence increases more rapidly in girls than in boys. Beyond the burden of a migraine attack itself, having migraine increases the risk. The vast majority of migraine sufferers do not seek medical care for their pain. Only 4% of migraine sufferers who seek medical care consult headache and pain specialists. Although 25% of sufferers would benefit from preventive treatment, only 12% of all sufferers receive it. 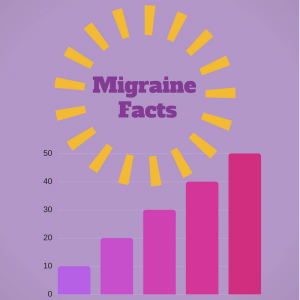 IF YOU HAVE ANY MIGRAINE FACTS THAT SHOULD BE INCLUDED ON THIS PAGE, PLEASE EMAIL ME THROUGH THE CONTACT PAGE. THANKS!